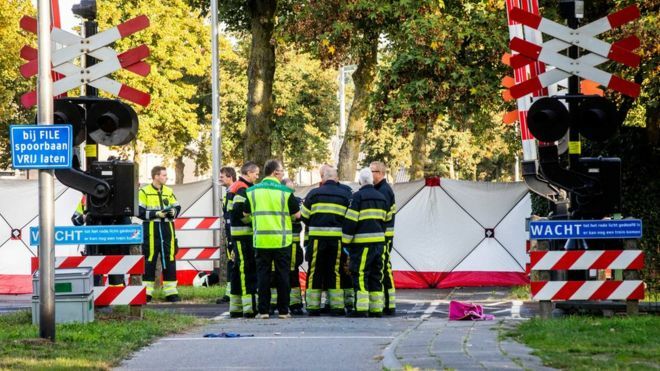 Four children from a Dutch day-care centre, two of them sisters, have died in a collision involving a train and an electric cart driven by a supervisor. The children were being taken to local schools in the cart when the accident happened on a level crossing in the southern town of Oss, west of Nijmegen. A fifth child and a woman were critically injured in the crash. The woman on the back of the cart had just dropped off a child at one school before setting off for another. Three of the five children were sisters and two of them died, officials said. Those involved the accident near Oss-West station were all of primary-school age, which in the Netherlands can start at four. Mayor Wobine Buijs-Glaudemans told a news conference that everyone was affected by the tragedy, and her thoughts went out to those families caught up in the accident. "There are no words to describe what they're going through," she said.